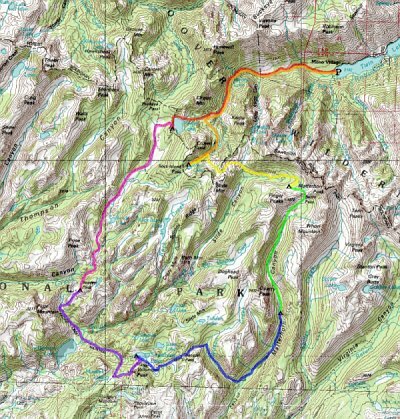 This being our second attempt at this route, I was planning on calling this trip Return to Broketooth Mountain. However, it turned out to be more appropriately called the High and Low Trip -- we experienced a large range of elevation, weather, and mood. And all our talk about the amount of snow and water last year was pathetic compared to the obstacles put in our way this year. Sadly, Eric couldn’t join us, so it was just Alex and I. A severe lack of goofiness was felt. On the way up I stopped off for a hike to Sardine Falls, just a mile off of US 108 near Sonora Pass. I then continued on to Bridgeport, where I spent the afternoon enjoying the July 4th festivities and exploring the Mono County Museum. Alex arrived around 6 p.m. We had a nice dinner at the Bridgeport Inn and then hung out at the rodeo grounds as the sun set. We skipped Travertine Hot Springs for fear they would be very crowded this weekend. Our first day’s hike was much like our last attempt in 2006, minus Eric and a mule. We carried our packs this time, and it wasn’t too bad. I didn’t take many pictures, though, so you can refer to the last trip for some scenery. At the first ford we had to remove our boots, which should’ve told us something -- I can’t even count the number of times we had to de-boot on this trip. In an attempt to avoid two more crossings after Barney Lake, we detoured over a small shoulder. This did not work out well, and we ended up having to de-boot anyway to cross a small but very speedy side creek. Halfway across I slipped, caught myself on a rock, and stood up again, still dry. Then I noticed one of my liner socks had fallen out of my boot and was floating downstream... I quickly reached out my hiking pole and scooped it up! Possibly my proudest moment on the trip. Peeler Lake was just as magnificent as we remembered it, but our excellent campsite was under a foot of snow and meltwater so we found something up on the rocks nearby instead. The lake water was so cold it was painful after about 10 seconds. We only took a brief dip. By the time it got dark at 9pm, we were too tired for a campfire and went straight to bed. This pattern repeated every night, and this ended up being our first trip without a single campfire. This day started out like the last trip, too: a pleasant meander down Kerrick Canyon. It was wet, but not flooded. Near the spot where Alex’s tooth had fallen out last time, we stopped for lunch on the idyllic, grassy banks of the ice cold, swiftly flowing Rancheria Creek. The sun was incredibly warm, though, so we swam and lounged for almost an hour. After lunch: Terra Incognita! We continued down Kerrick Canyon, through a fabulous little gorge below Price Peak, and then started up the hill towards our junction with the PCT and Seavey Pass. We soon encountered our first snow bank, which quickly turned into a series of snow fields. Seavey Pass is not tall from the north, but climbing up snow with a full pack is exhausting! Eventually, we struggled up the last pitch and found the first of Seavey Pass’s many lakes. While resting here, we ran into a nice New Zealander who was a few months into his hike of the entire PCT. 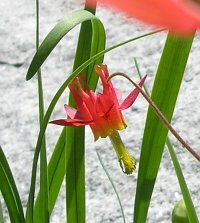 We thought that was kind of neat and unusual, until we ran into the next through-hiker. And the next. 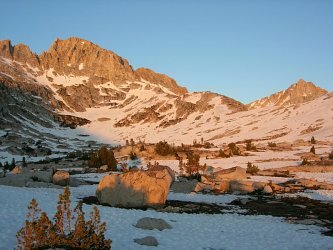 It turns out that in order to fit the entire PCT into a season you must follow a pretty strict schedule, which causes the through-hikers to travel in a loose pack. We just happened to hit our section of the PCT at the same time as the pack. We must’ve met a dozen over the next two days! It felt crowded. 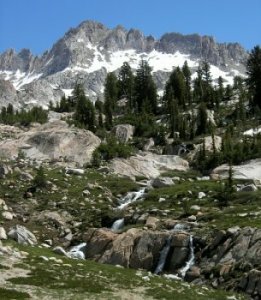 In any case, we’d planned to go cross-country to one of the larger, more remote of the Seavey Pass lakes, but our fatigue combined with the tumbled topography of the pass made this seem unwise. Instead, we found a lovely site at the far end of a small, C-shaped lake. It had a great layout and easy access to remarkably warm water. Much swimming ensued, despite the threatening profile of the Lake Monster underwater. This day started off with a 1600’ descent, during which we saw a half-dozen waterfalls. 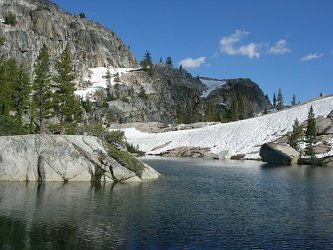 At the bottom of the hill was a swamp and a half-mile spur trail to what is supposed to be a jewel of the Sierra: Benson Lake. But the swamp was so teaming with mosquitoes that we couldn’t bear the thought of staying. We felt sorry for the other hikers we'd met who were planning on camping there. After struggling over or through three(!) difficult creeks in the valley bottom, we climbed a hundred feet up the opposite hill to some wind-blown rocks and had lunch. A 2000’ ascent -- in three miles! ...which at times produced hail stones the size of gravel -- they hurt like hell when they hit your head! 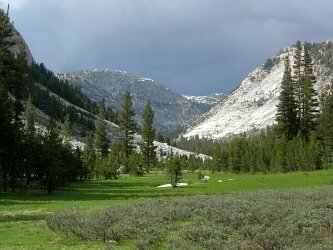 We hid out under a tree for a bit, then put on coats and gloves and kept going, continuing up under the dark sentinel of Volunteer Peak. 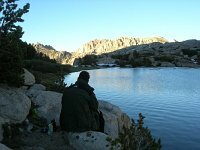 Eventually, we stumbled down to Smedberg Lake and began looking for a suitable camp site. The ground was soaked, all the sandy patches completely saturated. The sky was dark and mosquitoes swarmed around us. We settled on a slightly convex rock near the lake’s outlet, climbed into the tent, and grumbled. The sky cleared towards sunset, and we managed a quick dinner. It was a beautiful spot, but I was not very happy -- anxious and short of breath from a little altitude sickness. The day broke clear and bright, and Smedberg Lakewas infinitely more inviting. The swimming was bad, but I explored the lake outlet and took some nice pictures. We broke camp and started up the short climb to blissfully mosquito-free Benson Pass. From there, the trail descended next to Wilson Creek, a fabulous tumble of rocks, grass, and water. Once again we attempted to skirt two stream crossings by going off-trail, but this time we were more successful -- except for when Alex slipped and bruised up his arm. We re-joined the trail, which eventually dropped us onto the floor of Matterhorn Canyon. We followed the creek upstream to a wide crossing and had lunch while our feet dried. 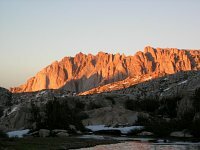 Immediately after the crossing, our trail left the PCT, and we didn’t see another soul for a full day. We attempted one more cross-country avoidance of stream crossings, and this one was also successful, though Alex looked a little uneasy on the steep slopes. We re-joined the trail just below Quarry Peak and set up camp in a small pine grove. It was a little early, but we were tired and wanted to get the tent up before the rain. The rain never came. We thought the spot would be mosquito-free, but 20 minutes later we were proved wrong. We spent a few hours enduring the very beautiful but quite buggy canyon, wishing we'd kept hiking. The bugs never let up, and we had a cold dinner in the tent rather than deal with them. We were so worried about mosquitoes the next morning that we skipped breakfast and speed-packed so we could get hiking as soon as possible. Guess what: no mosquitoes. It was at this point that I started to doubt my backpacking skills. 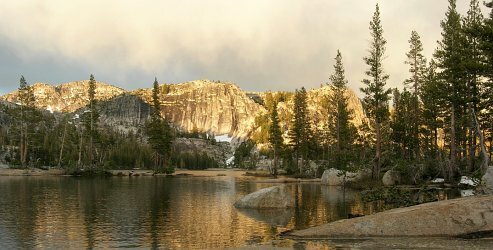 Seeing our mistake, we stopped at a large rock on the banks of Matterhorn Creek to eat something and enjoy a little bit of the morning. Alex, attempting to wash his hands, slipped and fell into the creek, immersing both boots. It was at this point that we started to doubt Alex’s boot traction and sense of balance. After drying out a bit, we continued up the canyon, eventually getting our first glimpses of Sawtooth Ridge and Matterhorn Peak. Then, under the massive granite shoulder of Whorl Mountain, we found the world’s most beautiful waterfall. It was actually a whole series of cascades, each unique, each beautiful and full of life, and all of them under the staggering point of Matterhorn Peak. We ate lunch and spent a couple of hours just sitting there, in awe. Finally, reluctantly, we decided to move on, ascending the final 800’ to Burro Pass. Alex had a tough time with this ascent and when we reached the snow-covered summit he wanted to keep right on going into camp rather than stop and enjoy the view. We slid quickly down a few hundred feet of snow, then made our way across the crazy moonscape of snow to the unnamed lake just below the Finger Peaks. This lake was one of my primary goals for the whole trip because I was sure it would have a great view of the Sawtooths. I was not disappointed. The view was fantastic: the entire Sawtooth Ridge, Matterhorn Peak, and the Finger Peaks surrounded us like the jaws of a world-sized Lake Monster. We set up camp on a great little outcropping near the mostly frozen lake and spent the rest of the daylight hours just gazing in wonder. There were no mosquitoes and no rain. This was one of the best spots I’d ever found in ten years of these trips. Alex, however, was not feeling well and began taking drugs for altitude sickness. We'd planned on spending two nights at Burro Pass and climbing Matterhorn Peak in between, but the gully to the top looked impassible, still covered in snow. Reluctantly, we packed up camp the next morning and started down the trail towards Slide Canyon. It was a pleasant walk, descending into a forest, and we successfully avoided two more stream crossings with some easy cross-country. Sadly, the forest was too thick to get a good view of The Slide, a giant, prehistoric rockfall that completely blocks the canyon lower down and shows up as a treeless rectangle on the map. Near the low point on the trail we ran into a Hoover Wilderness ranger playing hookey for the day in Yosemite lands. She had just come over Mule Pass and assured us it was passable. This turned out to be very fortunate for us, since her recent passage gave us a nice set of footprints to backtrack when the trail disappeared under the extensive snowfields. Unfortunately, our luck ran out where she’d slid down a 60-degree slope of slush and ice -- no way we could make it up that. We tried scrambling up a nearby rock outcropping, but it was too difficult and ended in a cliff (and a cut knee). So I stretched my topo-reading skills and figured out where the trail was supposed to be. Even then we had to climb straight up a steep hill of rocks and snow. By the time we reached the pass, we were exhausted both physically and mentally. We had a long, restful lunch, looking out over the Sawtooths, with Eocene Peak in the foreground and Crown Point behind us. At least, we thought, the hard part was behind us. Well, kinda. After passing a small lake and its lovely tarns, the descent from Mule Pass was a semi-controlled slide down a giant snowfield peppered with boulders. At the bottom, we finally picked up the trail again -- but ended up walking the wrong direction on it for a few minutes! Turned around again, we completed the descent to Robinson Creek, where our trail turned left and climbed 500’ to Snow Lake. After setting up camp, we strolled over to Rock Island Pass and around Snow Lake before settling down to our last dinner of the trip. We left Snow Lake early so we might have a chance of seeing our kids before bedtime. On the way back to the Peeler Lake trail, we passed Crown Lake and the Robinson Lakes, all of which were lovely yet somewhat trampled. After lunch at the junction, we retraced our path down to Barney Lake and then on down to Mono Village. On the way, I had a new experience: I was attacked by a mourning dove. It was quite startling, really: it ran in circles, beating its wings loudly, and then charged my boots. I have to admit, I backed up. The dove was soon satisfied, though, and took off into the bushes, where I saw a brood of mini-doves squeaking and running away. Back in Mono Village, we threw our gear in the cars, changed our clothes, and drove into Bridgeport to call our wives with the good news of our early exit. Alex took off, but I had an early dinner at The Barn -- best cheeseburger and fries EVAR!